Would you want to walk in China Anne McClain‘s shoes? Think about it. On the one hand, her “mother” is Ursula, that evil sea wench who made sweet little Ariel’s life so difficult. On the other, there’s her “father,” Jefferson Pierce, AKA superhero Black Lightning. How do you decide which path to travel? Fortunately, the singer/actress has had the opportunity to do both, playing Ursula’s daughter, Uma, in Disney’s Descendants 2, and Pierce’s daughter, Jennifer, in the CW’s Black Lightning, which will be debuting midseason. In the following interview, she shares her feelings about moving from one to the other and provides some teases on what fans can expect from her new series. Black Lightning is set in New Orleans, where former superhero Jefferson Pierce (Cress Williams) serves as the principal for a charter high school. Nine years after retiring from superheroics, he is drawn back into that world to fight back against a growing crimewave and corruption, and to protect his daughters Anissa (Nafessa Willliams) and Jennifer (China Anne). J-14: What was it like transitioning into doing a superhero television show? China Anne McClain: First of all, it’s awesome. I just came from playing a supervillain in Descendants 2. Now, to play a superhero is just insane. Awesome. This show is definitely darker than a lot of the CW shows, which I like. It makes it feel like you could walk outside of your house and just see Black Lightning walking down the street. Which is great, because it’s really, really relatable, so I love that. And you’re gonna see me having some fun with my powers. It’s not just going to be me being responsible. I’m gonna have some fun. J-14: What drew you to the character? CM: I just love playing strong female characters, especially being African American. I think that it’s really cool that you get to see that on TV. So when I got the script for it…actually, when I got even just the character description, I was, like, “I have to go in for this.” It seemed awesome to me and who doesn’t want to play a superhero? J-14: Who’s the first person you told that you got the job, that you were going to be on a superhero show? CM: My family, for sure. They were right there screaming along with me. I think they were more excited than I was. I think that those are the first people that you’re drawn to, to tell, because you know that they don’t have an agenda, they’re just going to be happy for you. J-14: How much will we see you just struggling with normal teenage things, even outside of having your superpowers? CM: You’re gonna see that a lot in the beginning, because when the show starts out, I don’t have my powers yet. I have no clue that anything like that is going on in my family. I’m just being a teenager and getting into a lot of trouble, sneaking out, all of that normal stuff that happens. And struggling. When the powers come, instead of it being, like, “Oh my God, I’m a superhero. This is awesome,” it’s more like, “I feel alienated. I don’t know what to do.” Especially since, at first I can’t control it. If I touch an electronic device, it shorts out, so I can’t get on Twitter or Instagram. It’s super alienating, okay? It’s super alienating. J-14: Did you read any of the comics or watch any of the DC TV shows to prepare for the role? CM: Oh my, yes. I definitely watched a lot of the pilots. I saw a lot of different ranges when it came to the show. Flash is a little big brighter, and it’s very, very colorful. Then Arrow is darker. Yes, I did read a few of the 70s Black Lightning comic books, and they’re quite different than our show. He had a huge afro, and all the dialog was very different. I’ve been doing a lot to get prepared. Now that I’m done with the press tour for Descendants, I can really get to know my character more through the comic books. J14: As both Black Lightning and Jefferson Pierce, Jennifer’s father has kind of created quite a legacy to live up to. Will Jennifer be struggling with that? China Anne: Definitely, especially because she has the exact same powers as her father, so she is definitely going to be struggling with that quite a lot. But her father’s really supportive and he helps her through it. He supports her through it. J-14: What do find in common with your character and what differences are there between you and her? China Anne: Well, something I find in common with her is she is trying to find herself and I feel like everybody, no matter what age you are, can relate to that, because we’re always growing and we’re constantly changing, and that’s something that she deals with a lot. Especially at the beginning of the show, so I can relate to that a lot. And, one thing I can’t relate to is probably the sneaking out and partying, ’cause I’m not that much of a partier. I like to be in my bed with a book or Netflix. J-14: Is there one moment, either that you’ve filmed so far or behind the scenes, that stand out most to you? China Anne: Probably getting my powers for the first time. Because I don’t think that my character, Jennifer, knows that her father is Black Lightning. She just has no clue what’s going on, at all. You see the electricity pulsing through her hands. That was a cool moment. Shooting that for me, and then seeing it finished and seeing how it looked was cool for me. J-14: From an acting standpoint, what kind of challenges do you face being on a superhero show? China Anne: Probably the physical aspect of it. When you come in, it’s like bootcamp. They whip you into shape. You are thankful for it afterwards, because you get on set and you’re ready. You feel prepared. But, ooh, the physical aspect is a lot in the beginning. J-14: Do you feel the show really nailed the whole family aspect that it’s going for? China Anne: Yes. I feel like it’s a very real family. Our parents aren’t together anymore. They’re separated, but they still have love for each other. Obviously, they have love for us, their children. That unites them in a way. It’s not your perfect family, but it’s also not a completely broken family. It’s somewhere in the middle. J-14: What’s her relationship with her sister going to be like? China Anne: Oh, it’s very strong, she is my protector, for sure, at all times. We have a little bit of separation, because I’m young and I don’t really want to listen to her, and things that she’s been through. She’s in college, so, there is a bit of a separation, just because of age and our lives. J-14: What do you think a family of superheroes would talk about during dinner? China Anne: They’d be, like, “So did you short anything out today,with your electricity?” I would actually love to see that. They need to do that on Comedy Central or something. A superhero family. J-14: You’ll likely be a role model for young women. China Anne: I’m not thinking about that. J-14: But how do you approach that? China Anne: Goodness. That’s a little intimidating, to be honest, when it’s said, but then once you start shooting the show and you actually get into it, it’s a lot less intimidating because you realize that you can only do what you can do. Trying to be a good example for young girls is a way of life. It’s the way that you live. It’s not like you can’t make any mistakes. It’s not about that. It’s about learning from your mistakes, and trying to tell other girls that it’s okay, and that you can always be better. I’m excited about it. 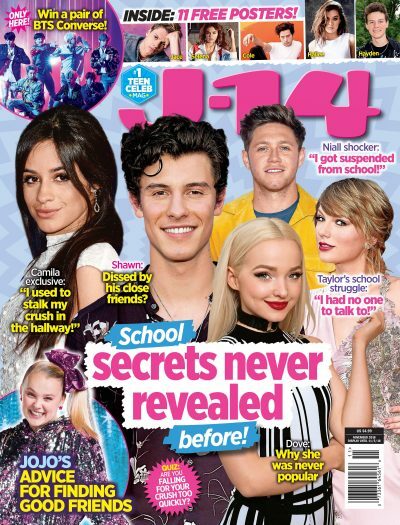 J-14: How important is it for this show to be socially relevant? What was going on in the 70s, pretty much it’s parallel to what’s going on now. It was just a different age. It was the social unrest. It was the civil rights struggle. Your character being so young and having to deal with such real issues, how are you going to approach your character having to deal with these societal struggles? China Anne: I love that question. There’s actually a scene that we shot where we’re driving, coming home from something. Our father gets pulled over by the cops, and taken out of the car, and slammed up against the car in the pouring rain. Didn’t do anything! At this age, we can really only watch, because it happens to our parents and we’re just, like, “This is wrong, but we don’t know what to do, and we feel so helpless.” Our dad is just, like, “Chill out. Everything’s gonna be okay,” because we can’t make any dumb decisions in those moments. We deal with some very, very real stuff going on in the show. Some very realistic issues. That’s another part that I think is really going to resonate, not just for African-Americans, but for everybody.